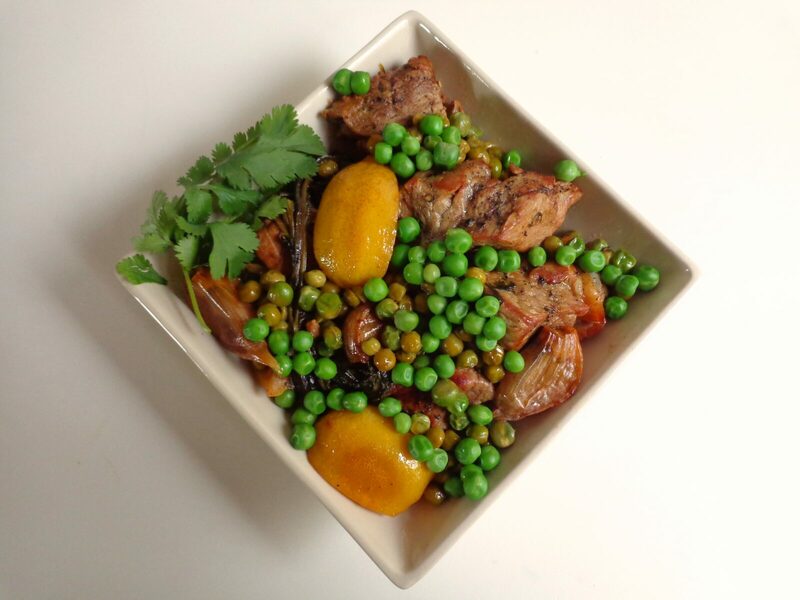 This Moroccan dish is unusual in that it uses fresh lemons, which marry perfectly with veal and first-of-the-season peas to create a zingy blend of flavors. The tartness of the lemon juice is softened by honey and cilantro, and the slow cooking results in a rich and succulent sauce. While lemon is often used in Moroccan cuisine, most recipes call for preserved lemons, which are pickled in salt and have a flavor so strong that they can be overwhelming. Moroccan tagines, or stews, typically combine meat or poultry with fruit or olives in an exotic blend of flavors that can feel almost Persian. When I first arrived in Paris (40 years ago — sigh) it was hard to find a tagine on a menu anywhere but at a Moroccan restaurant. But times have changed, and tagines have entered the French repertoire. You can now encounter a tagine pretty much any day of the week at a neighborhood Paris bistro. I like to serve tagines with couscous and a green salad on the side, although this is unorthodox — in Morocco, tagines are served in the clay pots in which they are cooked, with nothing on the side except perhaps some local flatbread. A meal would typically also include some Moroccan starters — like carrots with cumin, chick peas, spicy eggplant caviar, olives or roasted red peppers and tomatoes — and it would end with a light dessert, perhaps orange slices with cinnamon. Sound good? This entry was posted in 7. 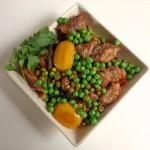 Meat Dishes and tagged cilantro, citron, honey, lemon, moroccan cuisine, peas, petits pois, recette, tagine, veal, veau. Bookmark the permalink.